The Violet War is the name of an expansive, modern fantasy setting designed by author and game developer Monica Valentinelli filled with gods, magical beasts, and the alchemists caught between them. The events of Violet War are now culminating. The alchemists are emboldened. They are reviving their horrific experiments, hoping they’ll become more magical than the gods themselves. 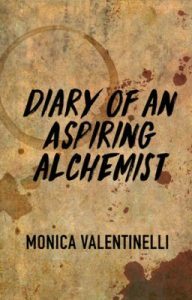 Diary of an Aspiring Alchemist captures the story of William Sand, a 20-year-old college student, who joins a mysterious society of modern-day alchemists called the Order of the Silver Star. Unfortunately for William, he soon finds himself drawn into a deep web of secrets and lies that will challenge his darkest impulses. This piece is ongoing, and is available to read for free on Wattpad. The story is being written and released as a “real time” journal. It is told in first person.